In February 1915, Walter Pollock of James Pollock and Son was sent for by Lord Fisher, who was known to him through Walter’s 1903 book of ship designs entitled ‘Vessels of Various Types’. Walter Pollock was asked on behalf of the Admiralty to design and oversee the construction of 200 motor landing craft for the Gallipoli campaign and to be designated as ‘X’ Lighters. The offices of James Pollock were at 3 Lloyds Avenue, London EC3; the plans were drawn up within 4 days of instruction. Deck of ‘X’ Water Lighter X28 (L4) Suvla Point (‘A’ West Beach) prior to the evacuation. Harbour constructed by 5th Anglesey Company, Royal Engineers, December 1915. The pier and breakwater has 20’-0” of water (click for full size image). With spoon-shape bow to take the steep shelving beaches, and a drop down brow (ramp). Dimensions were length 105-6” breadth 21’-0” (ex rubbers) depth 7’-6” with a light displacement of 135 tons, internal cubic capacities @ 1 ton = 100 cubic feet. Hull construction was based on River Thames, barge building, and was of a parallel bottom, over 60% of its length. Wooden supports, halter ropes etc were fitted to those vessels arranged to carry horses, a separate plan was for the hold and disembarking gangways and another plan for the carpenter for the gun platform, on completed vessels, the portable gun screens were supplied but the .303 Vickers Maxim gun of Army pattern was not fitted, due to shortage of supply. Heavy oil engines, mainly Bolinder, with Skandia, Avance and Campbell were fitted depending on availability. Pollocks were the British agents from 1910 for the Swedish J & C.G. Bolinder engines for over 20 years. Most lighters were single screw, but to use the available lower power units, some were twin screw, total brake horsepower per lighter varied between 40 and 92, giving a speed of 5-7 knots. 27 yards in the N.E. England and 3 on the Clyde were appointed to construct the 200 lighters. Despite common design, constructional details varied from one yard to another. Speed of production called for stock materials and local methods. Of the 200 built in 1915, 14 were converted to carry and pump water, most of the lighters had been delivered by the end of August 1915. In 1916 a further 9 water and 5 oil fuel were converted for UK use, these were given names: - i.e. OYSTER, TANKARD, LOBSTER, MOILER etc. The N.E . built lighters were taken to the delivery port of IMMINGHAM, on the River Humber, where they were all checked and, if necessary, minor modifications made. With the flexible steel wire bridles, 5 fathoms long, equipped to each vessel, the X lighters were towed to Devonport, up to 3 at a time, many on 10.6.15 then 20.6.15 to the Mediterranean with colliers from Cardiff and merchant ships. The Burrsfield 18.9.15 towing X130 stopped at Malta for a couple of days then 5.10.15 left for Mudros. Eighty miles short of Matapan she (Burrsfield) and the lighter were sunk by the submarine U.33. Just a few of the towing ships and dates from Devonport to Malta, 24.6.15 LEVENPOOL Malta; 7.7.1915, 23.6.15 INCHMOOR Malta 5.7.15, 24.6.15 MARGARITA Malta 10.7.15, 11.7.15 LORD ANTRIM Malta 23.7.15 etc. Direct tows from the Clyde to the Aegean, just a few with dates, FLYING FISH 20.6.15, FLYING MIST 23.6.15, FLYING SPORTSMAN 30.7.15, HENDON 24.6.15 etc. 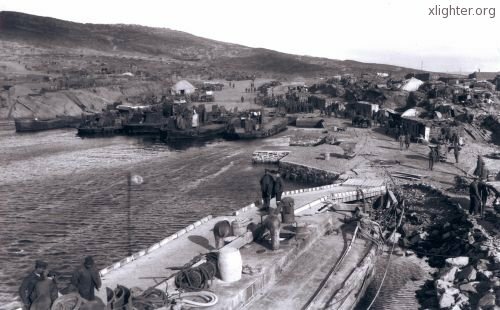 For the N. Russian Campaign of 1919 the X lighters went from Lerwick to the White Sea via sheltered waters of the Norwegian coast, some of the towing craft: - ST ABBS, DREADFUL, DANUBE, ALEXANDRA II, WILLIAM POULSON etc. 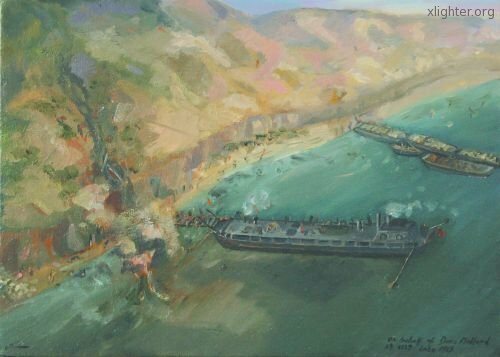 All of the lighters bound for Gallipoli were towed to the large natural harbour of MUDROS on the Aegean Island of Lemnos, towing taking approximately 25 days from Devonport. In succession of arrival in the Aegean, the 14 Water Lighters were given an ‘L’ number. i.e. L1 = x 182 — L14 = X96, and the lighters for troops, horses, field guns, stores etc were given a ‘K’ number i.e. K1 = X40 — K77 = x 166, 1915. An artist's impression of X127 at Gallipoli (click for full size image). Whilst serving at Gallipoli, 9 of the ‘K’ lighters were lost, all ‘L’s survived. These multi-purpose vessels took part in the withdraw of the troops and animals early January 1916 with great success. The X lighters were then dispersed to Constantinople, Lemnos, Salonika, Gibraltar, Egypt and two were taken to Bombay. From 1920, many of the 200 lighters were sold to private firms and shipping agents, and also to the governments of France, Egypt, Greece and 26 to the Spanish Government of which 11 survived the Spanish Civil War of 1936-39, 27 were in the N. Russian campaign of 1919 of which 3 were lost. 1922/23, 16 lighters were taken to Malta (Malta being the support base for the Gallipoli campaign). 5 were water lighters, L1 = X182, L6 = X111, L7 = X31, L9 = X127 and L10 = X131. 5 of the UK X lighters were used in the Dunkirk evacuation; all returned to Ramsgate. Because of their profile and being painted black, X lighters were known as Beetles, but X178, built by Swan Hunter and Wigham Richarson, yard no 999C Off. No. Tonnage 183170, twin 30 Bhp Bolinder engines, used at Portsmouth, then in 1929 used as aircraft transport. In 1955 twin 90 Bhp 3 cylinder crossley engines were fitted, sold to Bowker and King, Rutland 1966. This vessel was originally painted Red. As well as the 1915 X1 — X200 lighters, 25 motor store lighters were built 1916, X 201 — X225 and 25 dumb lighters (non-propelled) DX1 — DX25. Pollocks had nothing to do with these except to provide a few Bolinder engines. © Dave Mallard 2008. The information on this site is provided for non-commercial use only.